Remembering a new tradition of opening Resurrection Eggs each night leading up to Easter. Your daddy and I loved telling you the story of Easter and how much Jesus loves you. Remembering a quick photo with your cousins after church. Remembering our first year to host Easter dinner. Remembering how much I love decorating for a party. So fun. Remembering friends and family that gathered around our table. Remembering how we sang together and rejoiced that Christ is Risen! 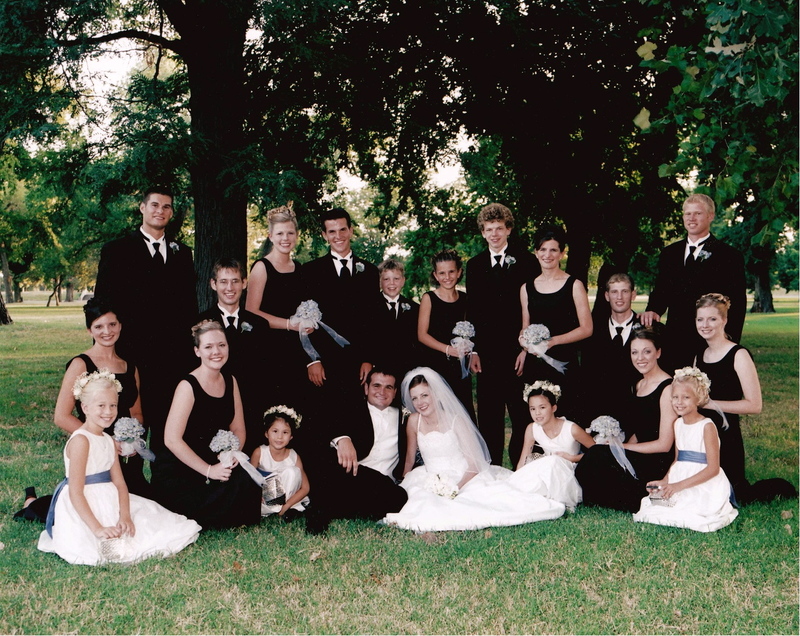 Remembering our growing family and missing our sweet little girl. I can only imagine how truly awesome it is! Remembering that you had no idea that we were supposed to have an Easter egg hunt. You were happy just playing with the empty plastic eggs. Remembering you throwing your eggs in your basket. You threw them over and over again. Remembering the Easter hugs and kisses from a sweet little boy. Remembering how special it was that my grandpa was out of the hospital and able to join us for dinner. Remembering your cute red Easter shirt and what a blessed Easter it was. **Words inspired by Ali Edward's post. I've been loving listening to Christ is Risen by Matt Maher as Easter approached this week. Our God is not dead, He's alive! He's alive! So, where are you today? I pray that today you are celebrating the amazing HOPE that Easter represents. The Hope that conquered sin and death and the grave. The Hope that is freely offered to each one of us. The Hope that is found in Christ alone. that ripped and tore and crushed him--our sins! We're all like sheep who've wandered off and gotten lost. We've all done our own thing, gone our own way. You keep me laughing constantly. You talk with your big brown eyes and have the best facial expressions. You are certainly a charmer. Not only have you stolen the hearts of your mama and daddy, but you usually make friends wherever you go. You always make sure to blow kisses and say bye-bye to everyone you meet. You clap, give high-fives, show us how big you are, give hugs, blow kisses, and recently daddy taught you how to show us your "big muscles". You smile and laugh a lot and I can't tell you how much you brighten my days. You are a jabber-box. You are starting to talk to yourself a lot. No one understands what you are saying but you. You say ma-ma, da-da, pa-pa, ba (ball), ba (block), bu (book), ta-ter (tractor), na-na (banana) bye-bye, moo (cow) and uh-huh (yes). You shake your head back and forth as fast as you can to say "no". It is so cute to hear you start to verbalize what is going on in that little head of yours. I love talking to you. You love to go bye-bye, whether that means just going outside or actually going somewhere. You just like to be on the go. You would stay outside all day if I would let you. Right now you like to explore, swing, and ride in your wagon. I am looking forward to playing outside with you and having you "help" me in the garden this summer. I can't believe how much you eat. I am going to be in trouble when you are a teenager at this rate. You always beg for a banana as soon as we get downstairs in the mornings. And no matter how much you ate at breakfast or lunch you are ready for a snack at any time of the day. I am constantly sweeping up cracker crumbs off the floor. You don't let us eat without praying. You fold your little chubby hands and loudly remind us that we need to thank God for our food. If mom or dad get up from the table you always think we need to pray again when we sit back down. And if we are ever out to eat and someone sits down at a table close by, you try to get them to pray too. I know that right now this is just a cute little thing you do, but I pray that a love for talking to God is something that deepens in your heart as you grow. You go to sleep with your pacifier and blanket every night. We are working on keeping the pacifiers in your crib and not using them during the day. When you get up in the morning or from your nap you throw them through the slats before we go downstairs. Your doctor says we need to try for no pacifiers at all by the end of the summer. Yikes! Visiting dad at work is the best. You love everything about the farm...cows, tractors, four wheelers. I think it is a good thing that we don't actually live on the farm or you would be begging to be with your daddy all day long. If you are ever a little crabby, a visit to the farm is sure to cheer you up...until we have to leave again that is. You love music. You love when mama and daddy sing to you. And whenever you hear music you bend your knees up and down or twist your body side to side to "dance". We read a lot of books these days. You are even starting to get very picky about which books we read. You like books with tractors and animals right now. Sometimes you insist on reading the same book five times in a row. If I suggest another book you will shake your head no and hand me the one we just read. You are twenty-six pounds, one ounce and thirty-two inches tall. You wear a size five diaper, size five shoe and mostly 18-24 month clothes. I am glad you love to walk because you are getting really heavy for your mama to carry around. You are a big boy! You are a true joy at fifteen months, Levi. The Lord knew that we needed a little boy exactly like you at exactly the time you came into our lives. What a blessing you are to our family. I can't wait to keep watching you as you grow. There is nothing better than being your mama. We finally had a beautiful day with no wind this weekend. Perfect weather for starting our garden. Joel had tilled up the dirt a few weeks ago. He started planting the corn while I went inside to get our little helper up from his nap. I really didn't think Levi would be too interested in our gardening project. Lately when we go outside he only wants to do two things: swing or go for a wagon ride. If I am busy doing something else he will stand under the swing or next to the wagon with his arms out begging...please play with me mama! But Levi's fun dad talked him into coming over and helping him. And it turned out that Levi thought planting potatoes was pretty great. Levi put every potato in a hole. Joel handed them to him one by one. His favorite part was throwing them in. And my favorite part was the high five after every successful potato toss. So sweet. Actually, Levi tore his onion apart while Joel planted all the onions...and I took pictures of Joel planting the onions. I did help though. When Levi remembered that he actually liked his wagon better than gardening, Joel took him on a wagon ride and I planted the lettuce. So the garden is officially started. I can't wait until it is time to eat all of our yummy vegetables. And I am so thankful to have a little helper this year...he makes gardening even more fun! Kristin - "Can I say I want everything? Because I want everything!" 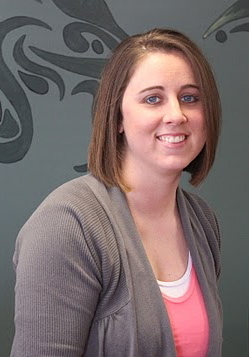 Congratulations Kristin! Send me an e-mail and you will be on your way to a DaySpring shopping spree! If you can't live without those adorable posy pins or if you are needing to stock up on cards, don't forget about the coupon codes below! Use coupon code 15OFFCARDS to get 15% off all card purchases. Use coupon code SPRING25 to get 25% off your entire order through April. Use coupon code shipping25 to receive free shipping on a $25+ order. This post is part of DaySpring's affiliate program. 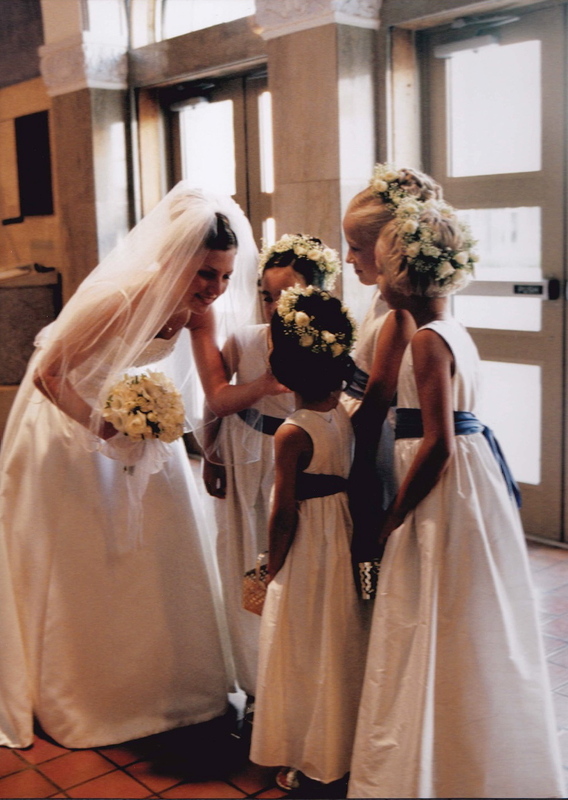 I had four sweet flower girls in my wedding. They were sweet as can be and looked adorable. 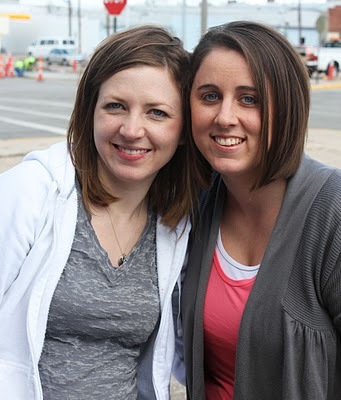 The two blonde headed girls are dear friends of the family. And the other two girls are my sweet cousins from California. 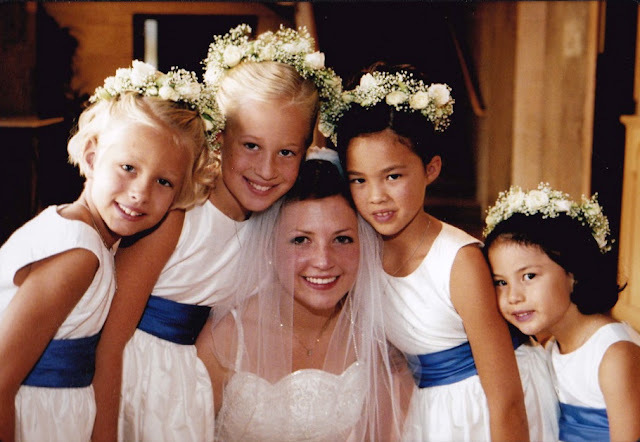 Now all of a sudden...almost nine years later...these girls have grown up. even though I'm pretty sure they are all taller than me now! A few weeks ago I got an e-mail from my cousin Simone. She is the littlest one on the far right. and was inspired by my post about Locks of Love. Simone told me that she has always liked her hair long and rarely cuts it. But she decided that she wanted to do something to make a difference in honor of my Cora. knowing my little girl continues to make a difference in the lives of others. Here are Simone's before and after photos. Twelve inches later...doesn't she look beautiful? I got a text from my friend Amanda asking if I would come with her to get her hair cut. Last year, Amanda started thinking about growing out her hair in honor of Cora. A few months later her 6 year old niece, Sydney, was diagnosed with Leukemia. Within a month, sweet Sydney lost all of her beautiful hair. That is when Amanda decided she had to donate her hair too. Here are Amanda's before and after photos. 10 inches later...and she looks so beautiful with her new haircut too! It was such an honor to be able to be a part of Amanda's hair cutting day. What a blessing it is to have friends and family with such big hearts. but there are some pretty great readers of The Macs out there too! A few of my readers have even donated their hair in honor of Cora. 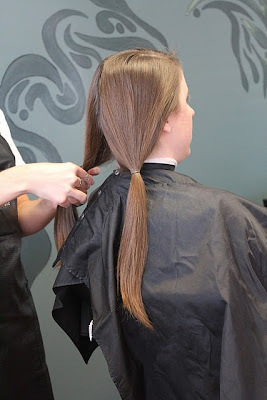 Today is the day my little girl (okay nine year old--maybe not so little) gets her hair cut for Locks of Love!! She is excited to get a fresh start and hopefully give that gift to another little girl! I am not sure what to expect as far as length after the cut but she says she is getting it cut like yours! Thank you so much for sharing your life and encouraging an already inspired little girl to do great things. to tell me that she too would be growing her hair out for Locks of Love. I told you I have some great readers! If you haven't you need to head over to Danielle's blog. She and her family are dreaming BIG. 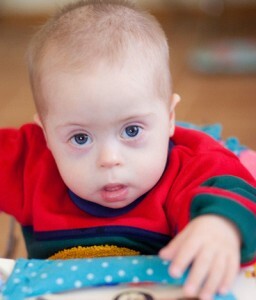 They are trusting in our BIG God to bring this sweet little boy home to his forever family. We have the opportunity to dream big along with Danielle and her family. and are fundraising to cover the costs of adoption. We can help bring little Sergey home to his mama. If you give just $10, you are entered to win one of MANY prizes. I am talking prizes like an iPad2 and Silouette Machine and so much more. You need to go check it out now! Don't forget that the DaySpring giveaway ends tonight. Go to this post and leave a comment for a chance to win! I got a really fun package from DaySpring last week. Do you want to see what was in it?? I am loving this Crisp Posy Pin Collection. I love the words printed on the leaves. I love the fabrics. And I love thinking of all the ways I could use these Posy Pins. They would be the perfect gift just the way they are. Three sweet posy pins. Or you could use one to embellish the top of a little gift. To let someone know they are loved. Or pin one to your purse. Or to your jacket. But I think for now mine are going to stay pinned to my ruffle pillow. I really like them there. There is a Sprout Posy Pin Collection too. You'll have to check them out...they are just as cute! I have been hearing so much about One Thousand Gifts by Ann Voskamp. Everyone has been talking about it. Voskamp challenges you to abandon yourself to the God who overflows your cup. I can't wait to read this book. My new DaySpring cards are just as fabulous as always. I picked these, these, these, and these. My favorite are these Carefree Moments birthday cards. I love the sweet photos. They will be perfect for all my girlfriends. Levi was super excited about the cards too. Probably because he knows that his mama used to spend three to four dollars per card at the store and now she can get a whole box of twelve cards for almost that same price! And the messages are so great in each one. Remember when I told you about the Hope and Encouragement cards and the Colors of Compassion cards? I still love them and have been using them all up. So, it was perfect timing to restock my little card bucket. I am still using my Give Thanks Wooden Caddy too. It is perfect for when we host our small group or family for dinner. So handy for all my silverware and cute turquoise striped straws. Guess what? You can win some of these great items too! $50.00 gift certificate to use in their online store! Are you as excited about that as Levi is?? telling me what you would buy with your gift certificate.